Broomrapes are strange parasitic plants. 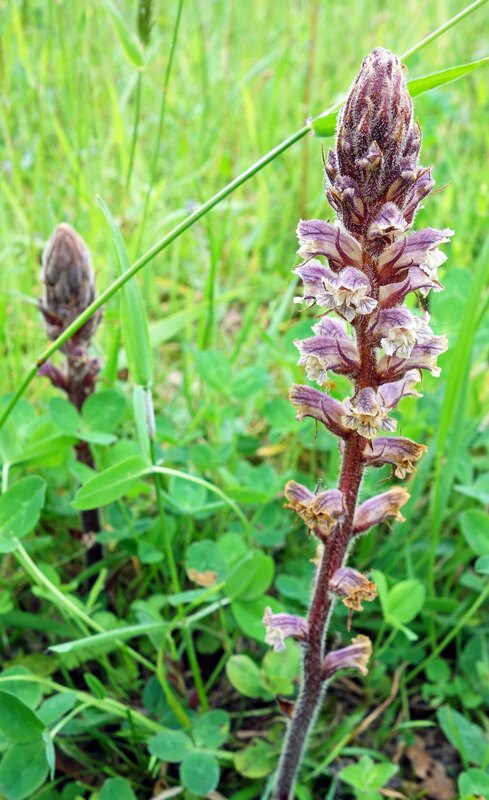 I did a blog on these plants before which featured Ivy Broomrape (Orobanche hederae) and Red broomrape (Orobanche foetida) in Galicia, Spain (1). 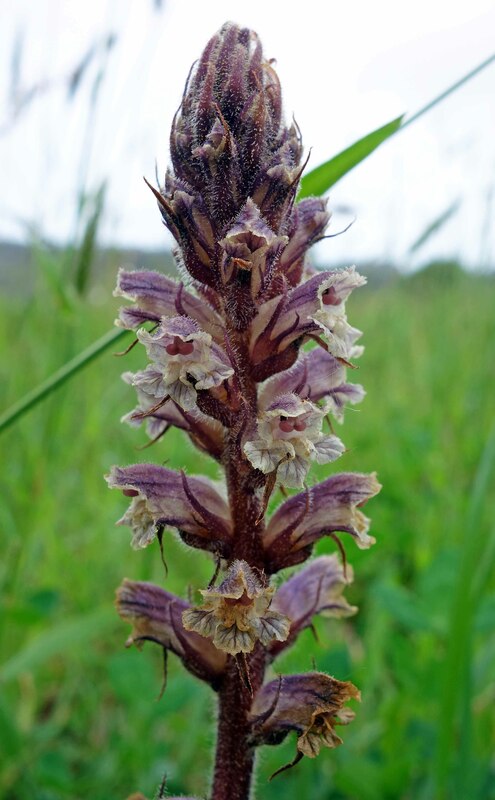 I came across another broomrape this year, which I think is Thyme Broomrape (Orobanche alba), a parasite of Wild Thyme (Thymus polytrichus) and other plants. Broomrapes are however, remarkably variable plants and their appearance changes quite a lot as they age. The flowers of thyme broomrape vary from purplish-red to white. The flowers of this one, which is freshly opened, are much more white on the inside. They seem to shoot up pretty quickly, and this one had opened up and flowered within a day. Since they are parasitic on the roots of other plants, the stimulus presumably comes from the host plant. One diagnostic feature of this species is that the bracts on the main stem that are shorter than the length of the flowers. Another very noticeable feature is the glandular-hairy nature of the stems and flowers, which is particularly obvious in this close-up (cropped) photo (below). Each of the tiny hairs ends in a small globular gland. I wonder what the purpose of these glandular hairs are? The funny looking red balls are the stigma – the female part of the plant – although they look rather like tiny little testicles hanging down. Sorry but they do! This species is quite scarce in the UK, so it is nice to see it in Spain. 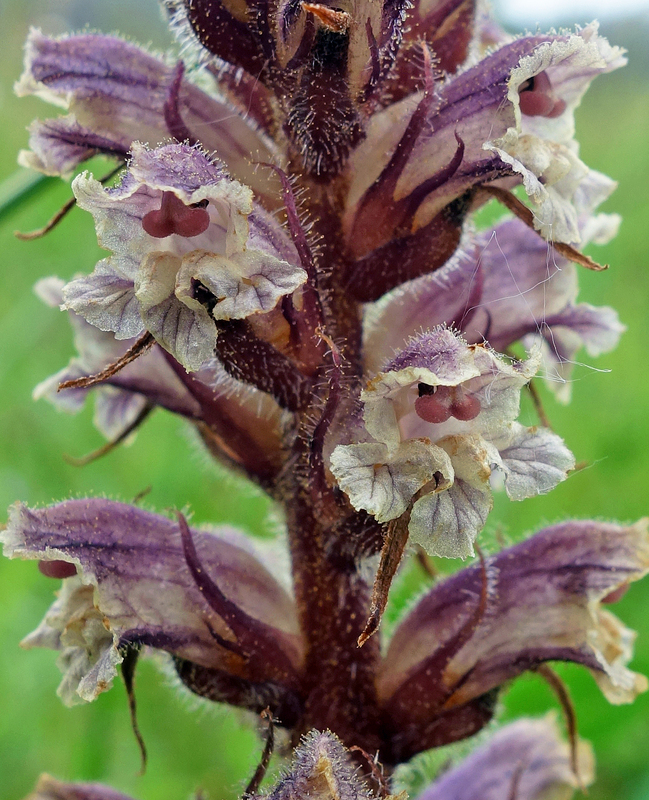 There are over 30 species of Orobanche in the Iberian peninsula (2), so plenty more to look out for. 2. Foley, Michaeli Y. “Orobanchaceae in the” flora iberica” área: new taxa, excluded-taxa, and typification.” Anales del Jardín Botánico de Madrid. Vol. 58. No. 2. Consejo Superior de Investigaciones Científicas, 2001. Previous Previous post: Pick up a polariser!